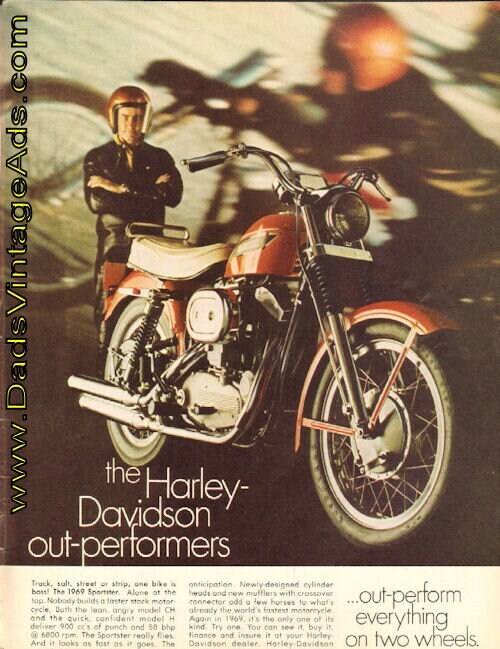 The Harley-Davidson out-performers. Track, salt, street or strip, one bike is boss! The 1969 Sportster. Alone at the top. Nobody builds a faster stock motorcycle. Both the lean, angry model CH and the quick, confident model H deliver 900 cc's of punch and 58 bhp @6800 rpm. The Sportster really flies. and it looks as fast as it goes. The re-styled tank almost leans forward in anticipation. Newly-designed cylinder heads and new mufflers with crossover connector add a few horses to what's already the world's fastest motorcycle. Again in 1969, it's the only one of its kind. Try one. You can see it, buy it, finance and insure it at your Harley-Davidson dealer.